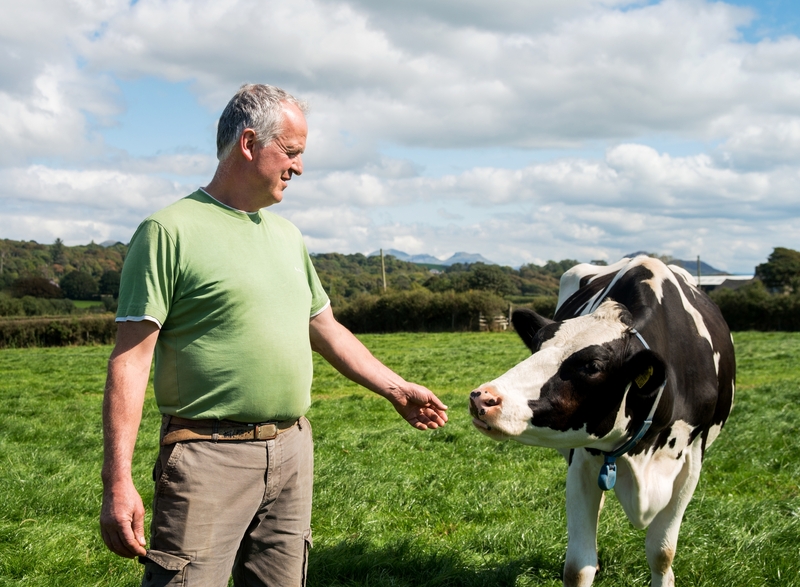 Ynysgain Fawr is a family farm located only 5 miles from our Creamery. The cows have one of the best views Wales has to offer, looking over Tremadog Bay. The Farm has been in the family since 1943 but the family has been supplying the creamery with milk since the very beginning in 1938. John & Sion, father and son are in charge of running the farm and it's a very exciting time for them as they've just moved into their new state of the art dairy parlour. 120 at the moment but with the new dairy we can go up to 170. All of our cows have a name as well as their own personality. Most of them are pedigrees, at the moment we've got 3 generations of cows. How do you take care of your herd? We believe that the happier the cow is, the tastier the milk is! All our cows have smart collars that let us know of any changes to the cow, which makes sure they get the best care possible. What time do you milk every day? 5 a.m. & 4 p.m.
Our new dairy will cut the milking time by 5 hours! We are working on being economically friendly. We've started collecting rain water in a tank and use it to wash the dairy parlour.